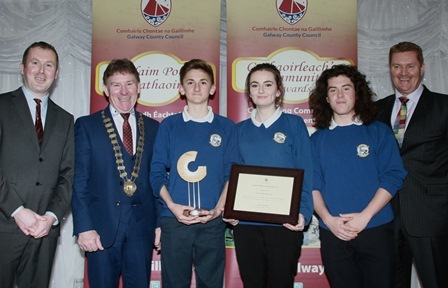 Cumann Óige Átha an Rí won the Best Contribution to the Irish Language Award ( non Gaeltacht) at the Galway County Council Cathaoirleach’s Community Awards 2015 in the Claregalway Hotel on Thursday 26th November. 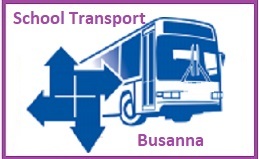 Cathaoirleach of the County of Galway Cllr. 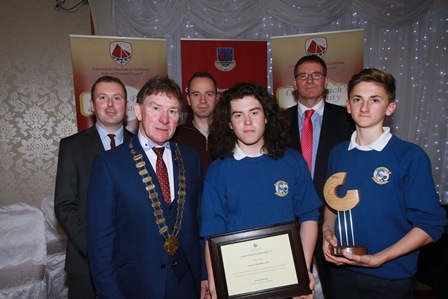 Peter Roche presents the award to Noah Dobell, Amy Nic an Chrosáin and Micheál Ó Gríofa with Sean Ó Mainnín (left) and Páidí Ó Lionaird ( TG4). 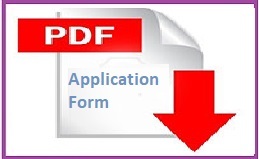 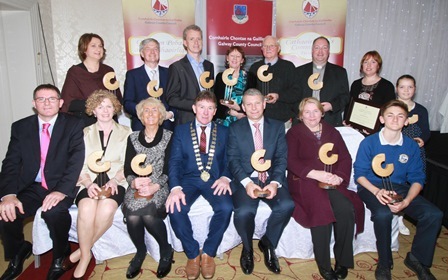 Galway County Council Cathaoirleach’s Community Awards 2015 in the Claregalway Hotel on Thursday night.